Exploring the Mars Frontier requires scientists, engineers and artists. My name is Corby Waste and I create artwork for the NASA Mars Exploration Program which is managed by the Jet Propulsion Laboratory in Pasadena, California. Since 1998 I've been at JPL visualizing Mars missions. I have to imagine what it's like to be on Mars or in orbit. Before I arrived at the Lab the Mars program mostly used paintings of their spacecraft. I create my artwork with computer graphics. 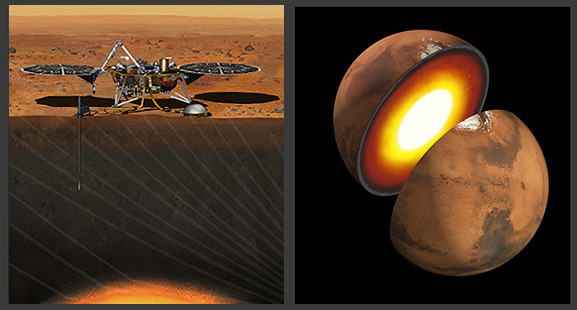 Most likely you've already seen my Mars or other mission artwork for years but never knew who created them because the image credits usually say only: NASA JPL. It's a big job helping to open up the Mars Frontier but someone has to do it! I am on Twitter as @MissionArtist. 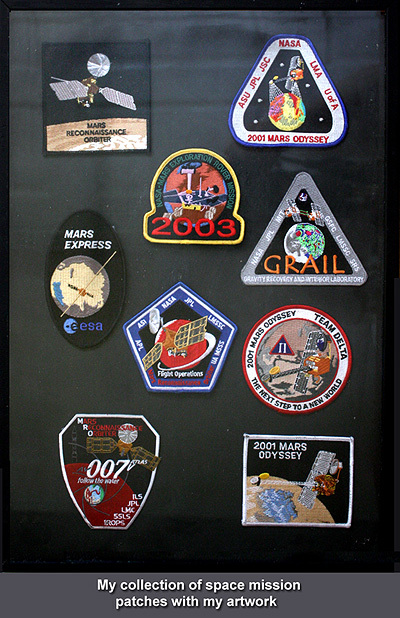 I haven't updated this whole section since 2010 and a lot has happened since then, like my GRAIL logo launch in Sept. 2011, the selection of the InSight Discovery mission with my artwork and my 15 cover illustrations for the National Academy of Science's Decadal Survey planetary mission studies. Basically, my job now includes much of JPL's Solar System and Moon mission artwork in addition to Mars. In 2012 I created an extensive series of images for the Mars Reformulation effort, orbiters, rovers and landers. NASA decided to select a 2020 rover. Recently the 2 Discovery Program proposals I supported with artwork were selected for further study: VERITAS and Psyche. There are graphical links all through this site - just click on everything to learn more. I'm working on a Mars Missions Art Gallery and my Solar System Missions Art Gallery with larger images of my art and career highlights. "MAVEN studying Mars atmosphere's loss to space" is an image I created in 2009 showing the 2013 MAVEN Mars Scout mission. 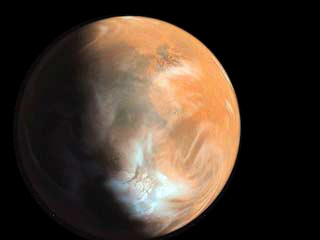 MAVEN stands for "Mars Atmosphere and Volatile Evolution". My GRAIL logo was launched on the side of the rocket in September, 2011. I was the main GRAIL mission artist for this Discovery Program mission. Oct. 8, 2008: Cost Overruns Threaten NASA's Next-Generation Mars Rover Project. The article used my artwork and added the words "What A Waste". Too bad the article didn't include the image credit: Corby Waste, that would have been a really odd coincidence! 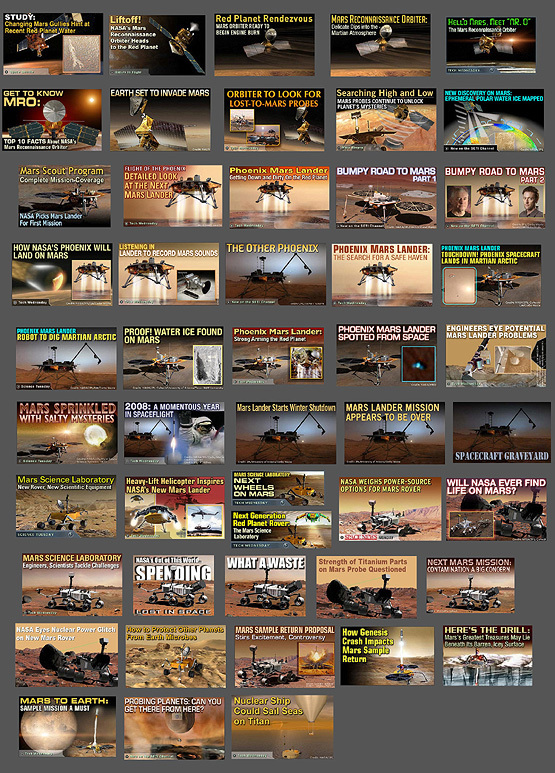 My Phoenix Mars Lander artwork appeared all over the world-wide media because of it's successful mission. 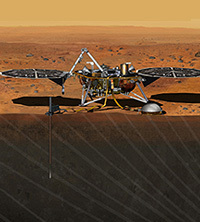 The graphic link above shows me in front of the Phoenix Mars Lander at Lockheed Martin Space Systems near Denver in 2007. Phoenix Mars Lander snapped these images showing the midnight Sun and clouds on Mars! I created a whole series of MRO images. MRO project manger Jim Graf shaking hand of Dr. Firouz Naderi, with JPL Director Charles Elachi in the center. Note that they are all wearing MRO Flight Operations Team shirts with my logo on them, standing in front of my artwork on the wall. They're also wearing special MRO MOI event badges with my artwork as well. It was a great day for Mars exploration and my artwork! NASA JPL has 2 highly sophisticated twin rovers called "Spirit" and "Opportunity" on Mars. They've been operating successfully now since January of 2004 and are still going strong. During the spring of 2004 my office was located with part of the rover team. Click on the images below to learn more. 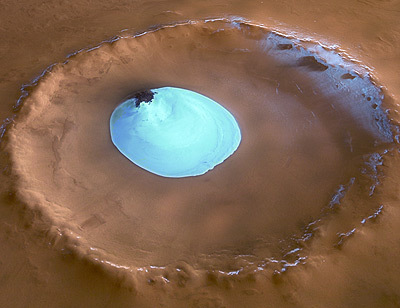 NASA is participating in the European Space Agency's Mars Express mission. All of the images of Mars Express on the US mission website were created by me. The Mars Express mission is turning out to be very important scientifically and the pictures it sends back are amazing - they can be seen here. Below is a recent example of the high quality images Mars Express is capturing. It is a special pleasure to be part of such a successful international Mars mission. JPL played a key part in it's success. My now famous image of Mars Global Surveyor Sept. 20, 2006 at JPL: I finally got to meet astronaut, scientist, educator/author Sally Ride in person. She played a part in my creation of the Mars Global Surveyor image, left. 2013 marks my 15th anniversary of helping the Mars program at JPL. Many people have asked me how I was able to get such a great job. Perhaps reading about my previous space experiences will help explain. Click on the link below to read about some my pre-JPL hightlights. 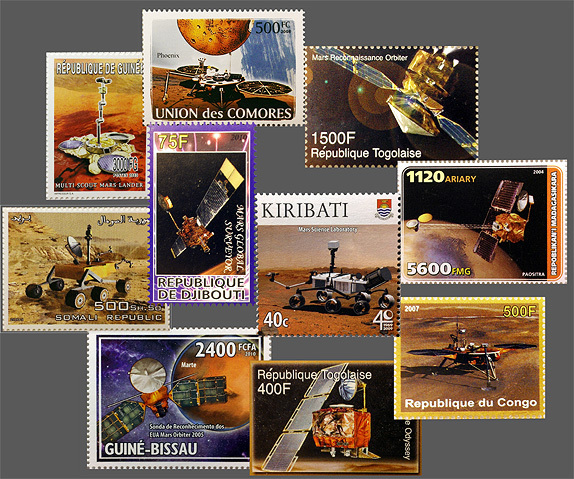 I've discovered 88 of my Mars mission images on foreign postage stamps! So far they've been issued by Guyana, Nevis, Niger, Palau, Somalia, Madagascar, Guinea, Dominica, Togo, Tanzania, Gambia, Cote D'Ivoire, Guinea-Bissau, the Comoro Islands, Grenada, St. Vincent and the Grenadines, Niue and Kiribati. Click on the stamps below to see some of my collection. My Mars artwork has also appeared in books, on mugs, watches, toy boxes, clothes, etc., but this is one of my favorites. My Dawn spacecraft appears on 2 more foreign postage stamps for a grand total of 87. Corby Waste, JPL, mentioned on BBC Comedy Show ! "LAST SATURDAY I WAS WATCHING A PROGAMME ON BBC 1 HERE IN SUNNY OLD PEMBROKESHIRE AND LO AND BEHOLD THE NAME CORBY WASTE CAME UP. THE PROG IS CALLED 'QI' AS IN 'QUITE INTERESTING', A SORT OF A PANEL GAME HOSTED BY STEPHEN FRY. THEY HAD BEEN TALKING ABOUT CORBY IN THE UK, THE CORBY TROUSER PRESS, CORBY WASTE DISPOSAL ETC AND FRY MENTIONED YOUR NAME IN CONNECTION WITH YOUR WORK AT JPL." That episode aired on Nov. 19, 2005. I bought it on DVD. Click on mini-poster to see larger version. Click on the link below to see where my artwork is being used in over 66 countries around the world. Note: many of these links may be inactive, it's been years since I've been keeping this page current. JPL artist Corby Waste, soon after his arrival on Mars on March 2, 1998. Welcome to Outer Space! The opinions expressed in the Fourth Millennium are strictly my own. This is not a NASA website.